Born in Hartford, Connecticut in 1956, Donald Baechler has lived and worked in New York City since 1977 and has shown extensively and internationally since his first one-person exhibition at Artists Space in 1980. His work is in the permanent collections of the Whitney Museum of American Art, the Museum of Modern Art and the Guggenheim Museum in New York, the Museum of Fine Arts in Boston, the Stedelijk Museum in Amsterdam and the Centre George Pompidou in Paris. Having amassed a great inventory of worldly images, recorded on slides and collected in the archives of his Lower Manhattan studio, Baechler draws on these images as the sources for many of his paintings. The images come from every source imaginable, and are stamped, silk-screened, projected, drawn, painted, printed or collaged onto surfaces. Then the process begins: underpainting, overpainting, canceling, adding, subtracting, editing until the final work emerges. 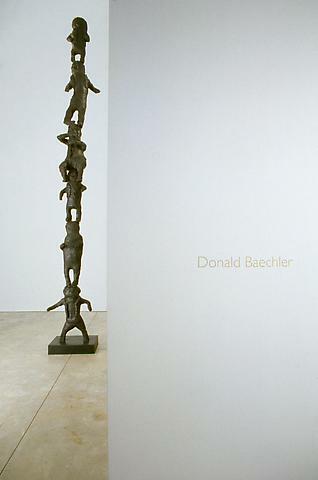 Along with several new paintings in the exhibition, Baechler's recent sculpture, STACK (LARGE VERSION) will be on view. Begun as a paper maché construction, the piece is cast in bronze and comprised of six individual figures stacked in a 20 foot "totem pole"; it is his largest work in bronze to date.